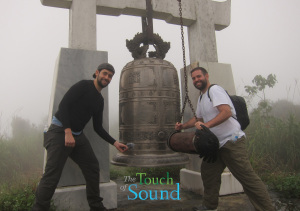 In November 2014, we had the privilege of traveling to Vietnam as a part of our ongoing project The Touch of Sound, featuring authentic sound recordings from around the world. As a country that has significant historical impact to our parents’ generation, we have long felt compelled to travel there and learn about it from our own perspective. We found Vietnam to be a feast for the senses. Along with the country’s abundance of sounds, the people were friendly and welcoming, the food was amazing, the culture was fascinating and the sometimes dark but important history came to life. Please enjoy some of the sound highlights from our adventure. The boat dropped us off at a small dock in Cho Lach, a smaller city in the Mekong Delta. Like many communities in the delta, the river is extremely important to their way of life and its many old bridges create a unique soundscape for its residents (Cho Lach Bridge). Our exploration of the delta then took us to Can Tho, the largest city in the region. Can Tho is famous for its morning floating market (Floating Market). The sound of the water market was an interesting contrast to the fish market we came across shortly after returning to land (Can Tho Market). As we continued wandering around the city, we discovered one of our favorite sounds of the trip when we came across an outdoor funeral ceremony. A group of musicians played songs in what appeared to be a celebration of life (Funeral Band). After our time in the southern region, we traveled to the center of the country and the Imperial Capital of Hue. South of the city is the Bach Ma National Park. We arranged to be at the park before it opened to record the sounds. A gorgeous misty morning greeted us alongside a vocal bird population (Bach Ma Morning Birds). Despite the immense natural beauty and remote feeling of the park, there were still reminders of the war, like when we came across the Bach Ma tunnels (Bach Ma Tunnels). We concluded our visit to the park with a hike up to the top of the mountain. We rang the large bell that sits at the summit and it sang out above the glorious nature (Bach Ma Bell). On our final morning in Hue, we listened to the Buddhist monks and their morning chants at a local temple. It was a wonderful way to finish our time in central Vietnam (Buddhist Monk Chant). Our journey continued to the northern part of the country for a boat ride on Halong Bay. Words, pictures and even sounds cannot properly describe the beauty of this area. Thousands of limestone peaks go on for as far as the eye can see. It was one of the more spectacular places we have visited in this world. Once again, we managed to get an early start and convinced our boat captain to take us to a local island to record the morning birds. (Ha Long Morning Birds). We were excited to get back to urban exploration. Upon our arrival to the capital city of Hanoi, another bustling metropolis greeted us. The old quarter is lined with beautiful architecture, but is also full of life and contrasting sounds. Our favorite sounds from Hanoi are of the numerous bike vendors whose pre-recorded announcements alert the locals of their product (Bike Vendor). Although the action is mostly found on the streets, traditional music can be found indoors at the historic Tuong theater (Traditional Music). The early morning activities near Hoan Kiem Lake provided a glimpse into the day-to-day life of the city’s residents. The locals came out en masse to perform their daily exercises. This resulted in one of the most unique sound experiences of the trip and was recorded on our final day (Morning Exercise). We found Vietnam to be a remarkable country. It is fast-paced and sometimes intense, but always interesting. We experienced three distinct regions with our limited time there. Along the way, we encountered extraordinary natural beauty, a vibrant culture and many dynamic soundscapes. Hopefully, we will get the chance to return someday. There is so much more to see and hear. For all published sounds from Vietnam click here.